Currently, we keep a lot of information on our mobile devices, so it is very advisable to make periodic backups of both applications installed as stored data. There are many basic possible methods to perform these backups, either from basic Android tools or from other apps that allow us greater control over the copy made. Let’s see here both methods. Basic Android offers the possibility of backup our setting preferences, so we can save a copy of our personal settings on the cloud. To ability this feature, we must go to the “Privacy” option in the settings menu. Here, we can save a copy of the configuration of our Wi-Fi networks, the data from some applications installed, our favorites and some additional information regarding configuration preferences. However, it doesn’t make any backup of the data stored in the phone. 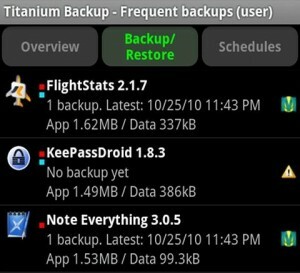 The best way to do a full backup of our Android apps and data is using Titanium Backup. To use it, we need to be root, so the first step is rooting our Android to get superuser permissions. Once we are root, we can install the app. It has two versions, one free and one pro with extra features that can be purchased for $6.80. When we open the app, we can see that it offers three options: general, backup/restore, and an option to schedule tasks. Thus, we can perform a single backup, restore a system from a stored copy and can also schedule regular backups. This last option is very useful because we can forget about doing periodic copies and we will always have a current backup. 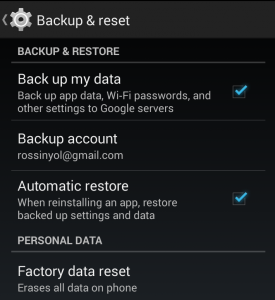 can download Titanium Backup and Titanium Backup Pro from the Google Play.